When Batman was reinvented from a comic book hero to The Dark Knight of graphical novels, the tones changed in both colors and plots from something colorful to something dark. As Batman was not gifted with superpowers and was relegated to silliness by the lampooning of the Adam West Batman TV series, perhaps a re-working was necessary to sustain any ongoing commercial interest. Despite the “POW” and “BAM” commonly associated with Batman, an audience remained and, in my opinion, has suffered for it in the movie theaters. Each of the Batman movies has tried to find the “dark” of the Dark Knight in terms of the colors within the movie. Scenes seem to be largely indoors or at night. What follows is a very depressing depiction of what big city life could or may someday be. But still, whether Keaton, Kilmer, or Clooney, the movies generally overplayed the villain’s comic origins, resulting in an all-star tribute to characters that had no connection to the audience. As mindless distractions in the theater, or in the comfort of your living room if wise, these were tolerable, at best. “Batman Begins” refocused on The Dark Knight, retelling the origin story. It was once again dark in tones, but Christian Bale was able to connect to the audience where predecessors did not, understanding the man inside the costume. And this made the movie closer to the potential of what a Batman movie should be, despite another “over the top” ending. That was a good thing, because this time, Batman is a secondary figure in the movie, and the various bat-toys neither steal scenes nor distract from the action. Okay, mostly. With rare exception, supervillains arrive on the scene in some splendor and have some sort of chip on their shoulders that give them cause to their evil. The last we saw The Joker, Jack Nicholson played the character like he plays any character. He may have makeup, but it’s still Jack Nicholson hamming it up. This time around, the curious choice of Heath Ledger to play the Joker (Robin Williams expressed an interest to play the role if one wanted Nicholson redux) is a resounding success. For one, he’s very, very good at playing a creepy character. We never understand truly why he is the way he is, but we recognize great evil when we see it, and we see it often. “The Dark Knight” probes at evil through this remarkable character, who prefers anarchy to the more typical selfish purposes (greed or vengeance, anyone?). But, the Joker is clearly (and entertainingly) evil, even as Batman is clearly (and boringly) good. It’s the dark that intrigues us, not the light. So The Joker fascinates us, and Batman more or less has the night off. 1) Two “bad” guys are recruited for one opening in the Joker’s gang. Whoever lives to join wins. This is a fairly easy one, but would you kill another human under that condition? Probably. Some wouldn’t, though. 2) Batman is forced to save either his girl-friend from childhood, Rachael, or the “White Knight” District Attorney who appears to be the most visible beacon for a corrupted Gotham City. Which do you choose, the “selfish” relationship or the greater good? 3) A ferry of convicted felons and a ferry of passengers are given triggers for explosive devices on each other’s boat. Push the button first, you live. If neither kills the other by a certain time, you both blow up. Who has the wherewithal to make the choice that dooms hundreds? What is the right thing to do? What is the wrong thing? On what basis do we choose? Or do you ignore the question? One of the Joker’s triumphs is turning the “White Knight” District Attorney into “Two-Face,” a fallen character who prefers to let chance sort things, like vengeance. Two-Face: “You thought we could be decent men at indecent times. But you were wrong; the world is cruel, and the only morality in a cruel world is chance… unbiased, unprejudiced, fair.” With his trademark coin, it is heads or tails by which fate is determined. This is the grit that makes a movie “dark.” It’s not a color scheme, or wet and steamy back alleys, or a city at night, it’s the questions raised that resonate with that little flicker of recognition of the evil desires within each of us. We’re horrified by the monster before us, but it touches our deepest concerns for ourselves, our families, our society, and our future. What we need is a “Dark Knight,” a hero who does the things necessary to make us feel safe. In Batman’s words: “Sometimes, truth isn’t good enough; sometimes people deserve more. Sometimes people deserve to have their faith rewarded.” He serves that purpose well. Pretty serious stuff for a superhero movie. Also, as the movie concludes 2.5 hours later, we must take some comfort that we've already had “Iron Man” for humor. I just recently saw Batman Begins, (I know, I know, it has only been out forever) and only then because it was on sale and I want to see it before The Dark Knight. I was very surprised at how good the movie was. 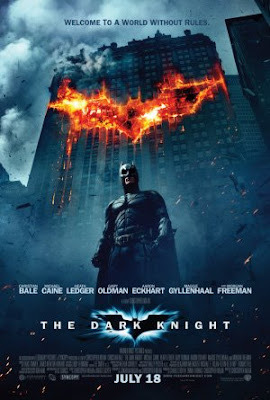 I can't wait to see Dark Knight now (especially as a Health Ledger fan). Isn't Batman the only superhero who doesn't have "super" powers? Everything he does is through his own intelligence and his ability to think & plan ahead. I think that is why Batman continues with such a strong following and keeps reinventing itself. The idea that anyone of us could be in his shoes if our circumstances were different lets us connect with him on another level.